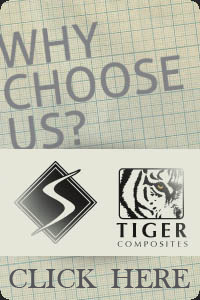 Tiger Composites, Inc. is in the business of designing, tooling, and producing composite structures. It is our wide range of experience and capabilities that sets us apart in today’s composites market. We are as comfortable with low cost marine fiberglass production and tooling as we are with aerospace grade autoclave cured exotic hybrid laminates. We have the ability to offer our customers the widest selection of tooling, material, and process options ideally suited to their product applications. Tiger Composites, Inc. has the ability to take projects from initial idea through engineering, tooling, prototyping, manufacturing, and sales. 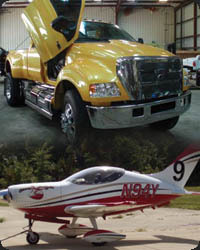 Tiger Composites, Inc. is your one-stop solution center for composites from basic covers and laminates to aircraft structures, spacecraft, ride vehicles, artwork or anything else our customers can dream up. We make vision reality. Tiger Composites, Inc. has in-house engineering available to help customers design products with the input and experience of a proven production facility. This important aspect allows engineers to directly interface with those who will produce their designs, providing insight into the best methods and products to use in a new design. Tiger Composites' engineering team includes proven industry leaders with the broad based experience to help anticipate our customer’s needs in multiple industries. Our experience has been used to provide engineered solutions for the Aviation and UAV industry as well as the theme park, automobile racing, marine and renewable energy market. We have several seats of Solid works Design software with full finite element analysis and computational fluid dynamic modeling capabilities. We have experience with most of the major engineering software packages and the ability to work with whatever format with which our customers are most comfortable. 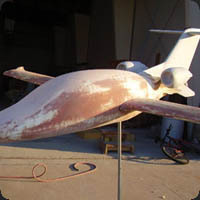 Tiger Composites, Inc. is a very unique company in the world of composites and assembly prototyping. We work with a very wide range of customers and production styles. This gives Tiger Composites the ability to look at a project from many angles and to use our vast production skills to select the ideal production material and process for each aspect of our customer’s projects. 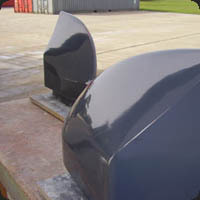 We can go from rapid low cost methods to high precision high production rate tooling very quickly and with great ease. This saves our customers time and money because we are so well versed in many different styles of tooling and production. This is not the normal case for most composites and prototyping facilities. Most of our competitors focus on a small amount of materials and production methods and then push their customers into the methods they are familiar with. Tiger Composites has no need to do this since we are comfortable in all composite production and tooling methods. Another big advantage that Tiger Composites has is our global production and tooling capabilities in Thailand and the Dominican Republic called Tiger Ltd. and Tiger SA. are a fully owned sister facility that serves as Tiger Composites' large production run factory. This sets Tiger Composites, Inc. apart in the industry in that we own these companies and control and manage them 100% giving our customers the highest level of security and performance available. With our offshore branches our customers enjoy global access and manufacturing costs with a single point of contact in the USA. We have a large pool of experienced employees to utilize on any customer’s project with the ability to ramp up new production very quickly. All tooling and capabilities at Tiger Composites have been duplicated at Tiger so there is a seamless transition for projects between Tiger Composites and Tiger. Since Tiger is owned by Tiger Composites and not just a vendor we also maintain full control of any of our customer’s proprietary information and intellectual property. Property of Tiger Composites, Inc. All rights reserved.